There so much to this story that Andolfo hasn’t shown us yet. 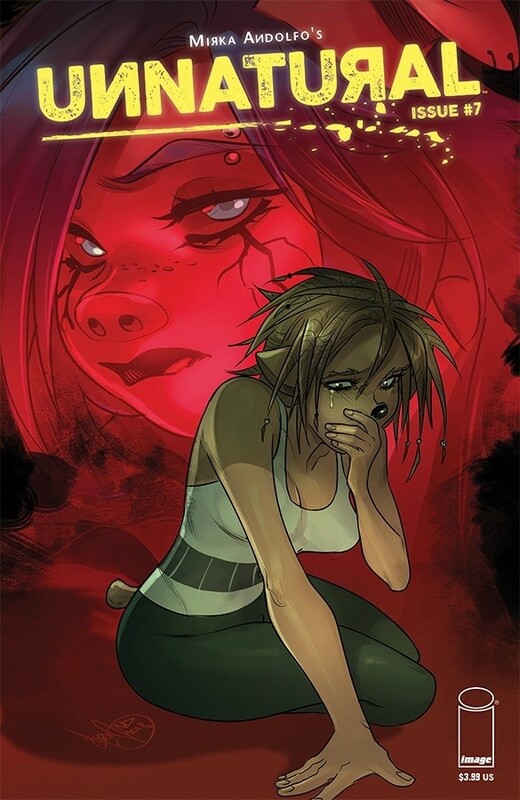 Issue #7 has Leslie, Khal and Saya on the run from the Glance’s minions. Leslie’s inner person makes their escape in much more gory then you would think. She’s a stronger pig the you would think. The issue gives us a little info regarding the Reproduction Program that makes us believe that it’s more then just hooking up animal people of the same species. This issue moves real quick and I feel like we’re losing the character of Leslie. She’s simply a pig on the run. She has something that will affect everything. The book needs more revelations instead of the procrastination. It’s like every time I think we’re getting somewhere, Leslie is attacked. While we’ve had little time with Saya, I think Andolfo has plans for her too in this story. Mirka’s art is still pretty, colorful and worth the price. At the end of the book, there’s a violent surprise. It gives us an idea what it’s like to have an albino wolf bonded to your soul. I keep hoping the story will go further each time, which it does…but I wish it would have a faster pace.